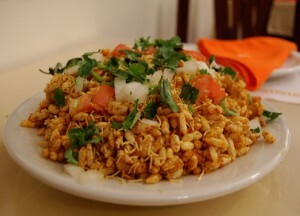 Bhel Puri recipe by Fatima at DesiRecipes.com. In a bowl combine the potato ,tomato ,sliced onion ,fresh dhuniya ,green chilies,boondi and chick peas. Keep the chutney and yougurt in separate bowls to be added according to taste. In another bowl combine the papri and rice crispies. You can also add a handful of plain corn flakes to make it cunchier. To serve, in a plate add the vegetable mixture. Top with the dry ingredients mixture. Add yogurt, chutney, salt and chat masala according to taste. why do you need 23 onions and 12 chillies, im sure it is 2 or 3 onions and 1 or 2 chillies!